Sysadmom (MOC Instructor, MCP, Consult, All things Windows nerd) who went offline 4 yrs & had #3kidsin3yrs now I'm back. I'll write about Tech stuff & parent stuff. I don’t like long explanations, directory locations or long talks on the phone. I enjoy long walks in the forest or long concerts. Then there’s always the User State Migration Tool (USMT) Technical Reference or 113000 hits on google containing the words USMT and Video. C:\Program Files (x86)\Windows Kits\8.0\Assessment and deployment kit\User State Migration Tool\amd64… *phew* every time SO I copied the necessary files from C:\Program Files\Bla\Bla\Bla\User State Bla\amd64 to C:\USMT instead. 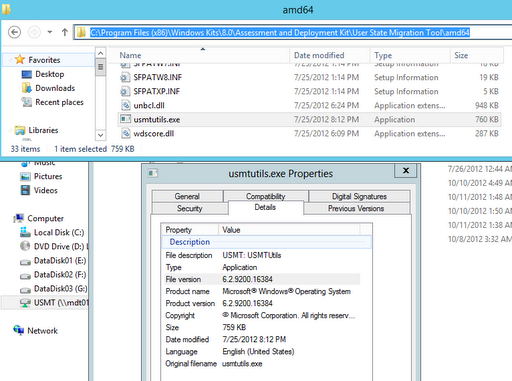 After doing that there will be a usmtutils.log file in C:\USMT when you run the command usmtutils.exe /? 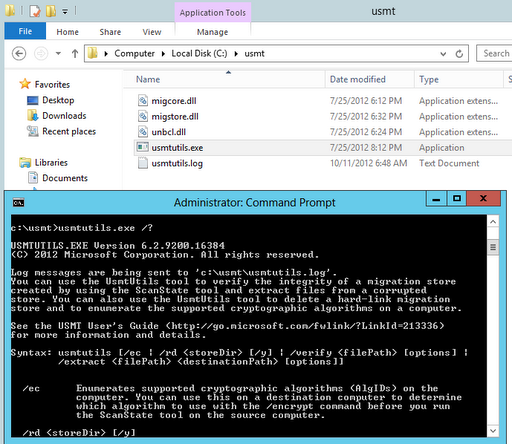 and a short explanation is displayed in the command prompt. I tawt I taw a tweet!